Another dolphin pod was rounded up by hunters in Taiji, Japan, early Tuesday morning. The pod of 60 to 65 striped dolphins was herded into a netted area in the cove and slaughtered under tarps to cover it from activists filming on the shore. 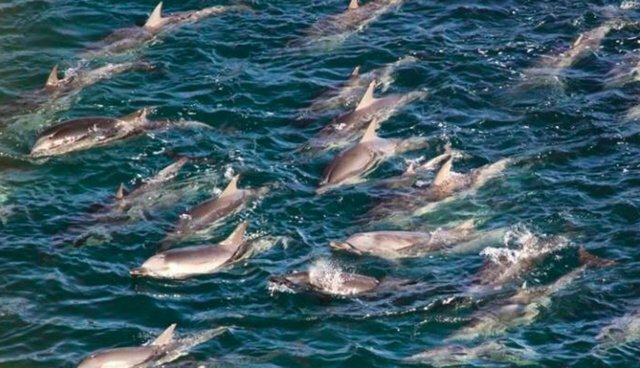 This slaughter is just the most recent in a string of hunts that has taken bottlenose dolphins, spotted dolphins, white-sided dolphins and others. According to the Ceta-base totals above, the hunt, which began in September, has totaled 1,270 dolphins from six species driven into Taiji's cove. Of those, 694 were slaughtered, 422 were released and 153 were live-capture. The hunt will continue until mid-March, activists say. Dolphin roundups and slaughter -- brought powerfully to the public's imagination by he Oscar-winning documentary "The Cove" -- happen every year in Japan. You can visit Sea Shepherd's site to learn more about the problem, and sign this petition asking the Obama administration to condemn the hunt. The organization has many ways you can help -- from volunteering to simply spreading the word on Facebook and Twitter. Sea Shepherd also encourages concerned citizens to call and write to the authorities in Taiji as well as the Japanese Embassy in your country, the U.S. Embassy to Japan, U.S. and Japanese Ambassadors to the UN and the U.S. Senate members of the Committee on Foreign Relations, among others -- all of their contact information is on this page. Another group involved in the issue is Earth Island Institute's Save Japan Dolphins.